Time-lapse photography NYC : Time-lapse photography for special effect can be highly effective for your promotional videos, and other such use. There are various options – static viewpoint time-lapse, or rotational time-lapse, or time-lapse with a cinematic motion of the camera. Where possible, camera movement of some kind (or created in post-production), allows these kinds of time-lapse clips to be fluidly integrated with other video inserts. Time-lapse footage can be rendered into 1080p or 4k videos, as you might require. 1080p is currently the norm, since this can be scaled for web use as well. Perfect for promotional use on your website. I’m a New Jersey / New York based photographer. Please contact me for more details & pricing, and to discuss your project and see how I may be able to help you. I worked with Jaguar’s social media team to create behind-the-scened time-lapse video sequences of a photographer shooting promotional images of a new range of hybrid Jaguar cars. This was in the early hours of the morning to avoid the crowds in Times Square. I compiled the footage from the two motion dollies that I brought along. This fast-paced video helps show the frenetic mood of New York. The largest time-lapse photography project that I’ve worked on to date, involved seven cameras running simultaneously while recording six graffiti art murals being painted – all during the course of one afternoon! These time-lapse sequences were shot for an agency that was creating a promotional video for MLB. The concept behind this was that they had five artists painting murals of the six most likely drafts for MLB this season. The challenge here was then simply one of logistics – making sure everything was set up and in place, ready to go before everyone started. This video shows the magic of time-lapse photography – an event that took 3 days to complete, was compressed into a much shorter visual time-line. This time-lapse video was created for an event planner for a wedding at Cipriani in Wall St, New York. This is one of the largest time-lapse projects that I have worked on, since I had 4 cameras set up to capture footage at various angles as the activity took place in various sections. The one camera with the aerial view was mounted statically, and the other 3 were moved around to different areas over the course of the 3 days that it took to set up the decor for this wedding reception. This video again shows how time-lapse photography reveals details that weren’t really visible at the time. This crane being moved from the construction site to the berth in the harbor, took nearly 4 hours to move — so slow, that it was barely visible to the eye. Anyone not specifically observing, would not have seen any movement. But with time-lapse you get a sense of the incredible power it took to move this colossal crane into its new position. 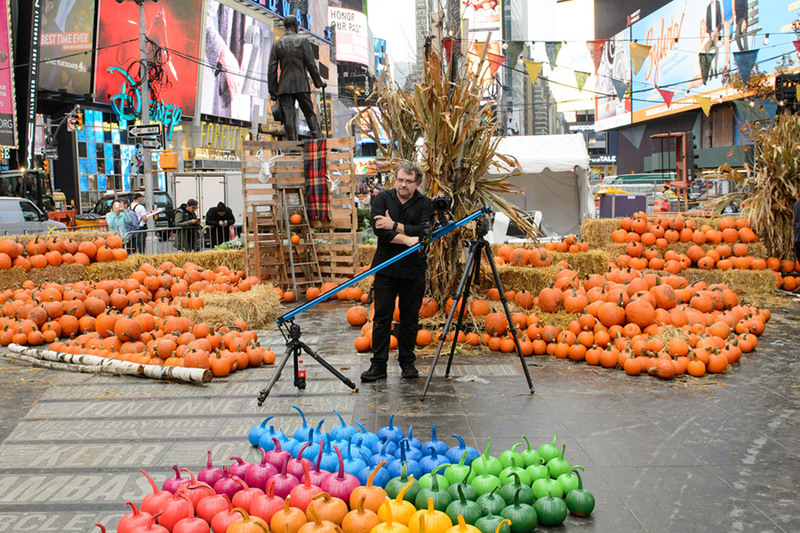 On October 29th, 2015, the Google Photos Pumpkin Patch was constructed in Times Square, New York. This time-lapse video is a compilation of the total of 20 time-lapse sequences we photographed. The pumpkin patch was constructed through the night (in a pouring rainstorm) to be ready in the morning when New Yorkers would start to visit Times Square, or just move through on their way to work. Of the 20 time-lapse sequences, two were finally used as the intro to Google Photos’ promotional video. A time-lapse video for a property management company, Emerge212, to show how one of their clients set up his office space here in New York. This was an interesting and challenging time-lapse project in that the area I had to shoot in, was relatively small. The behind-the-scenes page on this project will show how the cameras had to be mounted on the windows with suction cups to get a proper view of the event unfolding. The time-lapse video also includes interview audio with the designer, Robert Verdi. The smooth transition from day to night (or night to day), is one of the more challenging elements of time-lapse photography. So much so, that it is is referred to as the “holy grail” of time-lapse photography. My client here was a signage company that wanted time-lapse footage of their signs at the Jaguar / Land Rover head office, showing how they light up at dusk. Using 4 cameras here, various angles were captured, blending it all together in a way to show their product at this venue. A time-lapse video to shows the final step in the rebranding transformation at NJPAC – two cranes removing the old logo, and then hoisting the new logo up, letter by letter. This project took 3 days, and the camera had to be in a weather-proof housing, since the camera would be mounted outdoors. A time-lapse video that shows the progression as LAMY’s flagship store in New York was constructed and finished. This project was shot over an 8-week period with two cameras mounted high up on the door frame. To highlight a New York property adjacent to Bryant Park, we zoomed in towards the building during this video. This time-lapse video for a client shows the surroundings of the building – some of the bustle of New York and the beautiful park right opposite it. This kind of zoom technique is done in post-production, and working with a very high resolution, no detail is lost during the zoom effect!